We are Arizona Home Floors, the ONLY company in the Peoria area who offers a truly DUST FREE tile removal service. That is because our owner, Jack King, is the inventor and patent holder of the revolutionary DustRam® System Equipment introduced to the flooring industry nationwide. It consists of specialized tile removal tools for every step of the removal process and high performance, high powered vacuums that capture the dust at the source so it never has a chance to become airborne and contaminate your home. If you are looking for an exceptionally clean tile removal, with all of the tiles, thin set, mortar, and dust to be gone, call us today about your project. We use no plastic, no water and GUARANTEE your home will be as clean or cleaner when we leave than when we arrived! Our website is here to educate you about important aspects of the tile removing process and introduce you to DustRam® Equipment System that protects you, your family and your home during this potentially messy and hazardous process. Our proprietary patented DustRam® System is specially developed, military-grade equipment, rugged and versatile enough to remove any type of flooring dust free. The DustRam System consists of 6 patented & patent-pending devices that capture and contain the dust at the source, as it is created and during every step of the floor removal. This technologically advanced system not only eliminates dust from becoming airborne, it also allows us to remove the ceramic tile and other flooring more quickly and efficiently. Most projects are completed in just 1 day! Flooring can be removed from closets with clothing still hanging and pantries with food still on the shelves. Why use the DustRam® System? The DustRam® System was designed for customers concerned about the danger of exposure to the vast amount of dust created during traditional removal methods and maintaining the cleanliness of their home. Outdated tools and methods create dust, which can take months (or longer!) to remove from your home. Our dustless removal process protects you, your family, your home and your belongings from dust contamination during the floor removal. Only the DustRam® System provides a clean, healthy, and environmentally friendly way to remove tile flooring. This information will help you decide if we are the right contractor to work with you. The video above demonstrates some of our Dust Free Tile Removal equipment and services in action. See how quickly and efficiently our equipment and operators work, while leaving your home free of dust and debris! Please be on the alert for dust free tile removal scams that include mis-represented claims, poorly fabricated imitations of our products, discounted services, and use various terms similar to dust free, dust less, low dust, no dust or clean tile removal. 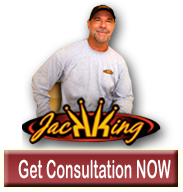 These companies lack our patented, state-of-the-art removal equipment, specialized training and expertise. Those other companies’ claiming 98% dust free means if your removal produces 500 lbs of dust (about 500 sq. ft. of tile), then 2% left behind is equal to 10 lbs of dust that will contaminate your home! Please call us at (480) 418-1635 or E-mail us today. The DustRam® System Equipment ensures better Floor Preparation! See the mottling effect in the picture? Most concrete floors have minor imperfections. Only our patented process of thinset removal makes concrete floors flatter and closer to installation ready. During thinset removal, our DustRam® modified grinders reduce the high spots in your concrete – resulting in dramatically flatter sub floors. Competitors use hammer drills that can severely damage the surface of your concrete, incurring repair costs. With our DustRam® System, your sub floor will be better prepared for the next installation of new ceramic tile, stone, hardwood, laminate or any other flooring. If you or your installer believe there is a hump in your floor that needs grinding, it could actually be a low spot that creates the illusion of a hump. We recommend that you watch the short video below to see why using a 5′, 6′, or 8′ straight-edge can be incredibly inaccurate for determining the flatness of your floor. High or low spots are best determined by using multiple straight-edges of at least a 10′ or longer length. The Arizona Home Floors method can flatten concrete inside occupied residential homes to an incredible 1/16-inch in 50 linear feet, well above Industry Standards. Our process enables us to determine exactly what areas are too high and the DustRam® System Equipment will grind those flat dust free. We can then raise the low areas to create what is known as a “Super Flat Floor.” For additional videos, please visit our Arizona Home Floors YouTube Channel. Dust Free Tile Removal | Tile removed in the following areas: Anthem. Avondale, Buckeye, Carefree, Cave Creek, Chandler, Fountain Hills, Gilbert, Glendale, Gold Canyon, Goodyear, Litchfield Park, Mesa, New River, Paradise Valley, Peoria, Phoenix, Queen Creek, San Tan, San Tan Valley, Scottsdale, Sun City, Sun City West, Sun Lakes, Surprise, Tempe, Tolleson & Tucson.